Join us live each week at www.productivity.academy/live and get your questions answered by submitting them at anytime right here: www.productivity.academy/questions. You can watch the video for the past episode recorded on September 6th, 2018 above, or you can review the transcript below. What are some tricks to keep completing tasks on your “To-Do” list throughout the day? If you will get stuck in one place due to heavy traffic, what do you think is the best thing to do to make your time more productive? Hey everybody. 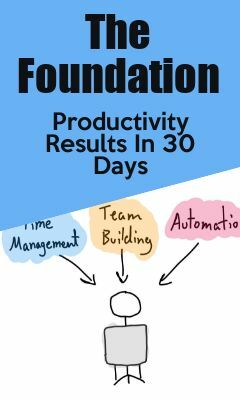 I’m Adam Moody with the Productivity Academy and welcome to Episode 51 of the weekly Q&A. So I’m really excited this is pretty cool closing in next week would be or will be Episode 52, which is equivalent to a year of weekly shows. I know I had a few where I’m traveling or things haven’t worked out so it’s been probably a little bit longer but that’s a milestone. There’s another with Semantic Mastery. We do a Hump Day Hangout, a weekly digital marketing and SEO Q&A, have kind of the same format and that we are about to hit four years of. So anyways, great to do this great getting questions. I love interacting with everybody and answering the questions. So if you’re just viewing this for the first time, you can always join us live, you can find the link below. If you’re watching the replay, you just kind of answer a few questions. If you don’t answer the questions, then you don’t get into the group. Sorry. But you got to show that you really want to be in there want to be around other people are interested in productivity and processes and all that good stuff. But we’re going to be going over a few really cool questions. I’ve got some announcements. But we’re going to be talking about ways to kind of continue knocking through your tasks on your to-do list throughout the day. And then what you can do when you’re when you’re stuck places, how can you be productive, like if you’re stuck in traffic, or if you’re on a trip and you get stuck somewhere. And then I wanted to go through a had a question from a new member, actually, of the group and about clear plans for updating a website regularly. So that kind of has to do with content publishing. But real quick one to say, if you haven’t yet, please join us in the group. And then if you’re watching on YouTube, I do publish the replays there. So everyone can check it out, hit subscribe to up to date with these as well as app reviews. And then specific one-off videos where we’re going through anything from how to use apps, how to create the framework for being more productive, all that stuff. Also, it looks like the Best Self Journal contest is winding down, it’s eight minutes left. So if you are watching this live, I highly suggest that you go over there, find the post with the link in it and get entered. Because I guess as we wrap this up, will we will pick the winner and have that announced. So let’s get started. So the first question for today is what are some tricks to keep completing tasks on your to-do list throughout the day? So good question. And I think one of one of the more important things to do with this is that you have a process or rather a framework for how you handle your to do here to-do list. So for example, what I mean by this is, do you actually have a to-do list? I know a lot of people say, Yeah, I do. But you know, if you asked like, Well, where is it like, well, I got an email that I haven’t read, I’ve got, you know, a post-it note over here, I think it’s really important to have all of this stuff together in one place. So I do that with the morning review, as well as the end of day review. But just the general idea here being that you have all of your to-do items in one place, so that you can refer to one place throughout the day and see what you’re needing to do. Beyond that, I would say, again, going back to that morning review, if you’ve already prioritized your tasks and kind of batch them so that you have similar tasks together, then you already know what you need to be working on. And again, part of that morning review is, you know, reminding yourself, what are your goals. So what did these tasks fit into, because I know and I understand other people to the same way, you know, maybe rounding up the spreadsheets for the end of month finances isn’t just the most mind-bogglingly awesome thing you’re going to do today. Or you need to do but it serves the greater goal of, you know, generating revenue for your business, paying your employees all these other things. And so keeping all of that in mind, I think can help you, you know, as a trick to help you keep knocking through your tasks is, you know, that bigger, a greater sense of, Okay, I already reviewed these and I know that these are part of my greater goals. So hopefully, that’s helpful. I think that that’s a good start to it. And there’s certainly more methods you can do one I’ll touch on real quick has to do more with time management. And that’s using you know, the Pomodoro technique. And just really briefly, without going into it, let’s just having a longer work period, and then a shorter rest period, and just alternating or rather stacking those and making sure that you do take breaks, everyone gets burned out. And so if you just, you know, are trying to go at it, and you’re just really working, but you just don’t take a break and don’t let your mind relax of, you know, you’re going to probably burn out much quicker. So I find that that is really effective and lets you let you focus in the end longer for a total time over a day. Cool. Good question. Um, let’s see the next question. If you get stuck in one place, you know, what do you think is the best way or the best thing to do to make your time more productive? I’m going to say this, again, it depends obviously, where you’re at if you’re stuck in traffic, I think man podcasts are just hands down my favorite go-to, you know, it’s mentally, it’s something you can do while you’re driving. And it’s usually not too distracting. And you can, you can either learn, you know, you could generally that’s what you’re doing. But what I mean by that is, you know, you can go over topics, like, you can learn something from a book or an instructional, even video, just listening to the audio, could be fiction, you know, there’s so many choices you have there. And I find that, you know, using that time like that one, it helps your mind, you know, it’s not exactly maybe work or work-related. But you could find out about some tangential area that you’re interested in, maybe it’s, you know, okay, really pulling this out of the air. But like, How to Win Friends and influence people, maybe it’s a good reminder of, hey, these are some good social techniques that could use to better network or interface with people, you know, here’s maybe a podcast, you know, on entrepreneurship, and somebody I respect and I listened to, and I think about leadership. And these are these times where it’s these topics that might be a little bit more gray area, or a little bit more fuzzy, and you can’t just sit down and go through the checklist of, you know, I do these three things, and I’d become a better leader automatically, you know, so topics like that I find to be really good for that. Other than that, I find that having a good reading list, I used Todoist, you know, whatever you want to use for this, maybe Trello is another good one where you could create a board and then is you have ideas for reading for times like this, where it’s maybe more of a strategic or higher level objective, you know, you pop in link so did you find a neat article? Is there a book you want to read? Is there a video you want to watch? And it may not be that urgent, or related to that the task at hand in terms of your weekly or 90 day projects, but it fits in with this is part of my greater goal, I want to, you know, have time eventually where I review that. So having that kind of file or list somewhere can be really helpful. Cool. And last but not least a question from the group what’s a clear plan for updating website regularly? So I’m going to do this a little bit in general, and just kind of tackle this from anything that has a regular schedule, and that either you or you’re having someone else do and I think that the first way to do this is to have it, let’s say I’m just gonna approach it from you are doing it. So let’s say you have a website, you need to update and it’s a weekly content, and there’s a couple other things need to happen. So if this takes more than, you know, 15 minutes, I would say that put this into the calendar, it’s recurring, it takes some finite amount of time. And I’m going to make it up and say, it takes an hour of your time. So put it at the same time each week if you can, and pop it into your calendar there. Now, that time at least is accounted for so that as you move forward, you start to understand, okay, this task has to happen and it’s taking up time in my calendar, it’s obviously something that exists, I think that’s the one of the problems we have is we add these tasks and we don’t have a clear understanding of how much time it may take us or what all is involved. So then the second step to this is to add to that calendar event. If you’re using Google Calendar, you know, you can just edit the calendar entry and put in there anything you need. So starting with the outline of the task if it’s updating, maybe you have a WordPress site, you need to update literally update the plugins to make sure the site stays up to date. So you do that you know it Do you need to update an article, okay, is there any instructions that go into that you maybe you link out to like a Trello card or to Google Doc that gives much more detailed or granular instructions. And then, you know, like I said, have all the links in there, you need so that you’re not spending time it doesn’t say like, go to website, update it and find that doc that I need to do blah, blah, blah, like have the link to everything he needs, you can click open it and you’re not spending that time, you know, going into, you know, Dropbox or Google Drive and searching for that file you need because those are prime time for distraction because you’re going to be kind of annoyed that you’re looking for it. Maybe you get a message but if you’ve got everything lined up, you’re just going to go through it and you’re really increasing the likelihood that you’ll succeed with that. So that is the way I do it. I picked up bits and pieces of that from people I believe first saw the idea with the links is not mind blowing I think everyone does this to some degree. Ramit Sethi had a really good explanation of how he does some of his content and does some of his writing and having everything in front of you when you need it. And so I took some of that to heart and have definitely incorporated that into my content production schedules and that just helps save time, saves me from being you know irritated and literally wasting time looking for what I need and the minimizes the distractions, which is an interesting side result of that is that you know, in those times where we’re doing that like looking for something those are times where you’re really likely don’t kind of wander off and be like, Oh, whoops, now in my email doing this or over there. So anyway, hopefully that’s helpful. It’s a really good question and of course we could get much more detailed about that depending on where it is but I think that’s kind of a good general framework for those types of situations. So don’t see any more questions so let me check over here and see we’ve got the Best Self Journal giveaway is over so let me do this it is ready to award alright going to do this live. Had 20 people enter and we had a winner and the email I will be sending it out. It doesn’t have their names. I’m obviously doing this for the first time it looks like it is a mark Oh salve. That’s part of the email. So if that sounds like your email, you keep an eye out and I’ll be shipping out your Best Self Journal. If this person doesn’t get back to me on redraw and get another winner. I’ll be contacting you. Like I said, Send me your address and I’ll pop it into the mail and you’ll get it and start using it. Best Self Journal has been awesome. I’ve talked about it before. I’ve used other journals which is fine if you like other ones better by all means use what works for you. But I’ve tried others I even kind of made my own which worked well and I may go that way again in the future. But then came across the Best Self Journal and really like the layout like the vast majority of what they’ve incorporated into it. And then aesthetically to it’s pretty nice, it’s in its handy to use so highly, highly suggest using it for your daily review. It lets you incorporate a morning review, end of day review. You can do weekly habits and monthly planning as well as your larger goals. So looking forward to getting this sent out to the winner. Thanks everyone who entered and hopefully we can do this again soon. So this will do it for Episode 51 and I’ll talk to everyone next week.